Former Broncos great Elvis Dumervil retired from the NFL on Thursday morning after 12 seasons in the NFL. The Broncos drafted Elvis Dumervil in the fourth round of the 2006 draft, and many NFL teams believed that Dumervil was too undersized, and that his 5’11” frame would not translate to the pros. Dumervil proved them wrong by putting up 8.5 sacks in his rookie season, despite appearing in only 13 games. Dumervil followed his impressive rookie season up with a 12.5-sack season in 2007, but in 2008, he regressed to five sacks, the second-worst season of his career. However, 2009 was the beginning of a new era in Dumervil’s career. He was moved to outside linebacker, which led to the best season of his career, including a career-high 17 sacks, and his first Pro Bowl appearance. Dumervil missed the following season with a torn pectoral muscle, and 2011 saw the addition of fellow pass-rusher Von Miller. The combination of Von Miller and Elvis Dumervil was short-lived, but it’s what many Broncos’ fans are hoping for from the Bradley Chubb/Von Miller tandem. The duo combined for 20 sacks, even though neither had played NFL snaps in the previous season, and then followed it up with 29.5 sacks the next season. 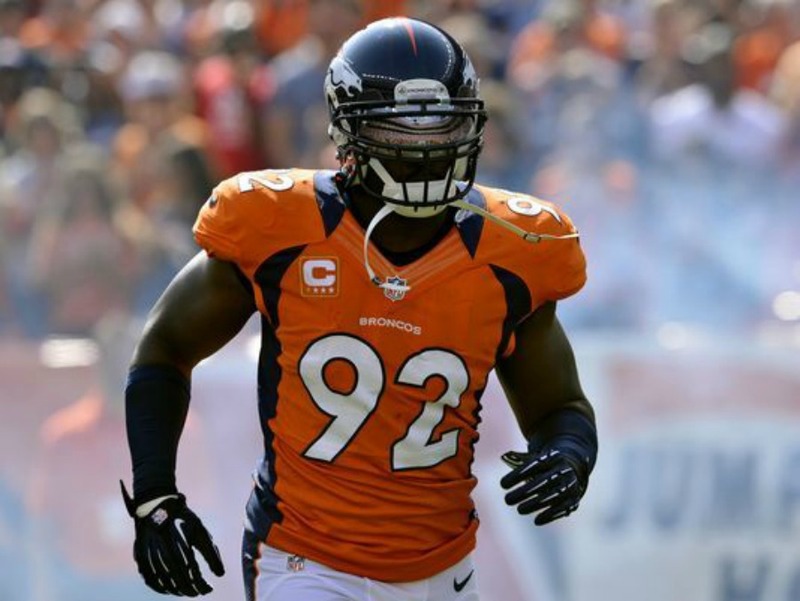 After the season, the Broncos needed to free up cap space, and Dumervil agreed to restructure his contract, but under the terms of his contract at the time, if he was on the roster after 2:00 PM on March 15, his 12 million-dollar salary would become fully guaranteed. Dumervil needed his agent to fax the Broncos the paperwork for the restructured contract, but his agent was asleep at the wheel. At 1:59, the Broncos cut Dumervil to avoid the 12 million-dollar cap hit and received the paperwork at 2:06. Dumervil fired his agent and ended up signing with the Ravens. Dumervil spent four years in Baltimore, during which he added two Pro-Bowl appearances, another first-team All-Pro selection, and 35.5 sacks to his resume. Without a doubt, Dumervil belongs in the Broncos’ pantheon of greats. If it wasn’t for a bad agent and an unfortunate fax, Dumervil would’ve most likely finished his career in Denver. During his limited time with the Broncos, Dumervil was voted to three Pro Bowls, one All-Pro team, and racked up 63.5 sacks — good for fifth in Broncos history.